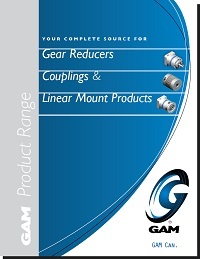 Mount Prospect, IL - July 15, 2013 - GAM Gear, a manufacturer of precision gear reducers, servo couplings, and linear mounting kits (products designed to simplify mounting to linear actuators), announces the release of the 2013 GAM product range brochure. With eleven gear reducer styles, twenty four coupling styles, and linear mounting kits, GAM has one of the largest product offerings in the motion control industry. All of GAM’s products are arranged in the brochure by category, performance level, and application type which makes it easy to find the right product quickly. “The product range brochure does a great job of showcasing our product breadth.” said Craig Van den Avont, President of GAM Gear.